* Added video: 108-year-old Chandler and Price old style letterpress: 2 color job resulting in a wedding invitation with Ginkgo design. * New photo photospecial page: Germinating Ginkgo seed. * Added on my Art-page: Former convent with Ginkgo art nouveau design, Zaandam, the Netherlands. 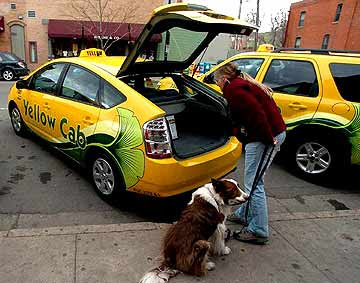 Boulder (Colorado) Yellow Cab is adding a handful of hybrids and propane-fueled cars to its fleet as a way to cut fuel costs and lessen the need to increase fares. The hybrids sport a Ginkgo leaf that runs the length of the cab. Read more here and here. The Kids’ Chalk Art Project is an event to celebrate and invest in the creative spirit of children, and it is also the launch of “Re-Enchanting the World Through Art,” a non-profit project that supports and inspires creativity and the imagination. The first project is to collaboratively create the World’s Largest Chalk Drawing with the kids of Alameda CA, from kindergarten through high school, and the greater community of the San Francisco Bay Area. 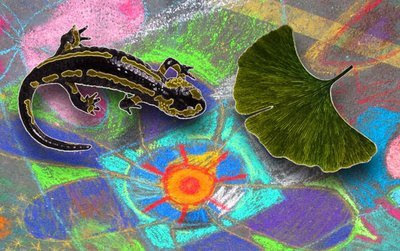 Mark Wagner is creative director and founder of this project and writes a story in his blog about salamanders and a Ginkgo leaf. Read his story here. * Added some photos I made while visiting the Biennale 2005 Gilbert & George Ginkgo Pictures. * Added many photos I made of Ginkgo trees in Germany, Spain, France, Italy and Slovenia. 1) remove flesh from seeds and wash seeds : don't do it with your bare hands! 5) wait for a while, seeds become very hot! 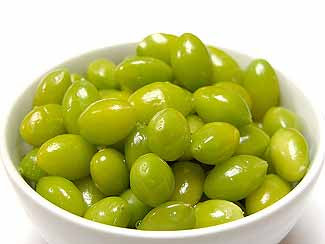 Eat no more than c. 6 ginkgo seeds a day. Read my usage-page about the seeds as a food source. * Added YouTube video: A row of Ginkgos in Tokyo, Japan. You Tube video showing Ginkgo trees at Jingu Gaien street in Tokyo, Japan.